KABUL – The number of Afghan civilians killed in armed conflict surged to a record 2,118 people last year as the Afghan war turned increasingly bloody, the U.N. said in a new report Tuesday. Insurgents were responsible for 55 percent of the deaths, but U.S., NATO and Afghan forces killed 39 percent, the report said. Of those 829 deaths by the forces, 552 were blamed on airstrikes. 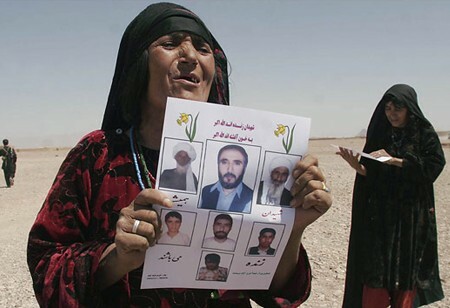 An Afghan woman on on Tuesday, Sept. 9, 2008 holds a poster with photos of her family members, who were killed on August 22, 2008 during a US led raid in Azizabad village of Shindand district of Herat province. Close to 3,000 American forces who recently arrived to secure two violent provinces near Kabul have begun operations, and their commander admitted that civilian casualties could increase because of their presence. The Pentagon is contemplating sending up to 30,000 additional troops this year, a development that could also increase civilian casualties. The U.S. and Afghan militaries this month announced plans to increase the number of Afghans who will take part in U.S. operations, a step aimed at reducing deaths of ordinary Afghans. Despite new battlefield rules meant to reduce civilian casualties, U.S., NATO and Afghan troops killed 31 percent more civilians in 2008 than the year before, the U.N.'s annual report on the protection of civilians said. In 2007, the U.N. said those forces killed 629 civilians. "As the conflict has intensified, it is taking an increasingly heavy toll on civilians," the U.N. said. 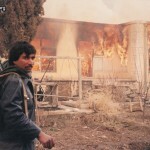 The report said militants were responsible for 55 percent of civilian deaths last year, or 1,160. About 130 deaths couldn't be accounted for because of issues like crossfire. Militants increasingly rely on roadside bombs, car bombs and suicide bombers, attacks that are "frequently undertaken regardless of the impact on civilians," the report said. Two attacks highlighted that trend — a February suicide bombing at a dog fight in Kandahar that the U.N. said left 67 civilians dead, and a July car bomb attack on the Indian Embassy that killed 55 civilians. Military leaders have long sought to emphasize how militant attacks kill far more civilians than the soldiers or officials usually targeted. The report also noted a U.S. mission in August in Azizabad that the U.N. says killed 92 civilians, including 62 children. A U.S. investigation says 33 civilians were killed. The war is increasingly dangerous for aid workers as well. The U.N. said 38 were killed last year — double the number slain in 2007 — and 147 were abducted. NATO spokesman Maj. Martin O'Donnell said civilian casualty numbers compiled by the NATO-led force and the separate U.S. coalition show their forces killed 237 civilians last year. He said the U.N. numbers could be higher because they include deaths caused by Afghan forces and private security firms. O'Donnell said a directive by top commander Gen. David McKiernan issued in September to cut down on civilian deaths was probably made too late in the year to lower the numbers. "I think the fruits of those initiatives are yet to be seen," he said. A U.S.-based group that advocates for civilians in conflict said in a new report released Tuesday that "the lack of a clear, coordinated strategy to address civilian losses has been a leading source of anger and resentment toward military forces" in Afghanistan. "The international coalition in Afghanistan is losing public support, one fallen civilian at a time," CIVIC, or The Campaign for Innocent Victims in Conflict, said. The United States military and other members of the NATO-led force in Afghanistan make some condolence payments to the families of civilians accidentally killed in battle. But CIVIC said that a "significant number" of families receive no help from international forces and that anger is especially strong when no help is provided. "Every family with losses not recognized and addressed is another obstacle to Afghanistan's stabilization and development," the report said. The CIVIC report urged the Pentagon to create a position to address civilian casualties, and it said the NATO-led force in Afghanistan should have a coordinated response to provide compensation payments to the families of victims. In an example of militant activity killing civilians, the U.S. military said its forces responded to a roadside bomb explosion in Kandahar province on Monday that killed five Afghan civilians. The IED likely had been intended for Afghan police or international troops. A study conducted in Afghanistan showed that in 25 percent of homes where adult addicts lived there were signs of significant drug exposure in the children tested, some as young as 14 months. The children exhibited typical behavior for opium-heroin addicts: experiencing withdrawal when the drug was removed.